My dog says he wonders why people give absolutely no thought to the barbaric act of boiling another living creature while he/she is still alive? 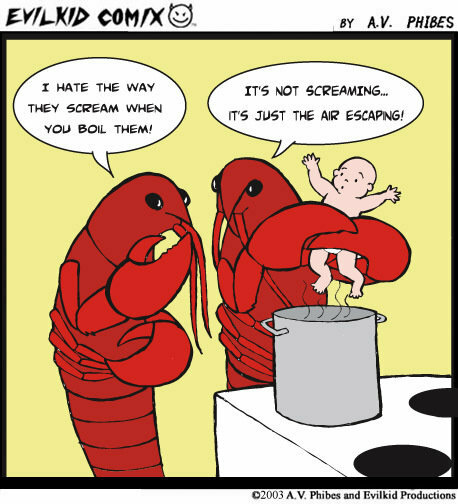 Yes, boiling them alive. Seems like a twisted act taken from a sci-fi book, doesn't it? The next time you happily scamper up to the lobster tank at your local restaurant to select your victim, ah, make that your entree, remember this: lobsters feel pain. Yes, friends, lobsters feel pain. Hi Babz! I've missed seeing you around the ole' blog! Thanks for stopping by again and leaving a comment. Some of the traditions that humans have really seem quite twisted, don't they? I've never understood how anyone in their right mind could think this practice is alright. Really quite demented, huh? There aren't enough hours in the day you know, and still trying to save those cats claws. But I like your doggy blog and must come more often. Thanks, Babz. Always nice when you stop by. You'll be happy to know the anti-declawing movement is getting some positive traction in California. West Hollywood, Santa Monica, San Francisco, Los Angeles, Beverly Hills, and Berkeley have all passed bans, and proposed declawing bans are being considered in two more cities (Burbank and Culver City)!